Ok, I’m a dog person…a crazy, mushy dog person. I get the whole cat thing – really I do. We’ve had cats in our family and when they snuggle and purr and deign to acknowledge you with an arbitrary display of affection, it feels good. But for me, there’s nothing like a dog. Teddy sits in my lap while I write, Archie encourages me to forget what I’m writing about by bringing me his ball in a never-ending game of ‘stop-taking-yourself-so-seriously-and-play-with-me’. Neither of them are going to score off the charts on any canine I.Q. test, but they would be in Mensa if the requirement was affection and loyalty. Teddy did get a certificate once for being ‘Perfection In Fur’ – but that was because he didn’t really take to the training for which completion certificates were issued. And it’s true, neither is particularly discerning, and were it not for the barking, a robber would be made to feel welcome. Ah well…they’re my guys..
And here’s a weird one for you..the first dog we got when we moved here was Bubba The Wonder Dog. And he was a wonder dog – probably could have been a brain surgeon but for his webbed paws and absence of impeccable hygiene. A big guy, Bubba would sit on my lap during our regular drives up to NY and NJ – 70 lbs of lap dog. When I was diagnosed with this funky autoimmune issue, Bubba would just stay with me on the bed, he’d lick my face when I cried and made it very clear that he was going to be my side 24/7. After each surgery, Andy would hold Bubba and lift him onto the bed so that he could arrange himself for the duration without bumping up against some unpleasant incision somewhere. Bubba was diagnosed with an autoimmune disease too and when living became too much for his body, I couldn’t handle my sorrow. How could we both get hit with the same ball?? Posted on July 25, 2012 by mimijk •	This entry was posted in friendship, humor, life lessons, love and tagged Dog, Pets. Bookmark the permalink. Beautifully said and wonderfully true..
Oh my goodness, it is so sweet and it made me tear up a little. We learn so much from the world around us and the people we have in our lives but the animal, those wonderful, sweet, loving animals can teach us so much with just a look or a lick. By the way, I love the new look of your blog with the balloons and colors – all of it looks great! I love the white fluff’s name – Stuart!! And a round of applause for your son. There’s just nothing like puppy love – no matter the age of the dog or the age of us! Imagine what the world would be like if we all loved each other, the way our dogs love us! Wouldn’t it be amazing…and if we saw ourselves as our dogs see us..I think we’d be all the better for the corrected visual..
so, so true. i have a loo lb lap dog wanna be. stopped allowing the lap time around 70 lbs, that’s about as much dog poundage as i could handle. but he lays on my feet and looks at me with those big browns of his when it’s time for my feet to start rubbing that ‘buddah belly’ of his (such an apt description that it). would be lost with out him. Whoever said that dog are a man’s best friend….was absoooooolutely correct!! I couldnt completely read your blog as it was overwhelming for me…my best friend is not keeping well (age) and my heart sinks each day. I will never have the courage to have another her. Darn, they make you so weak from within…such soulful creatures…gift to mankind! I am so, so sorry to hear about your best buddy. I didn’t think I could stand the pain when Bubba went away. I swore I couldn’t do it again. And three days later Ozzie and Harry came home, because the absence of any love in our house was even worse. Enjoy your girl while she’s here, cherish the love that she’s brought to your life and maybe one day another wonderful love will come into your life – different undoubtedly, but wonderful nonetheless…I know how hard this is, and I’m sending you a million hugs..
It’s hard to celebrate a gift like that when you are watching them slowly leave. But those angelic presences remain, in our hearts certainly, but also in how we welcome love in the future.. I have a cat that fetches, but he knows full well he is no dog, and so do I…sigh. I think a fetching cat (applying both definitions to the word ‘fetching’) is definitely trying to be worthy, and he should get major points for that!! 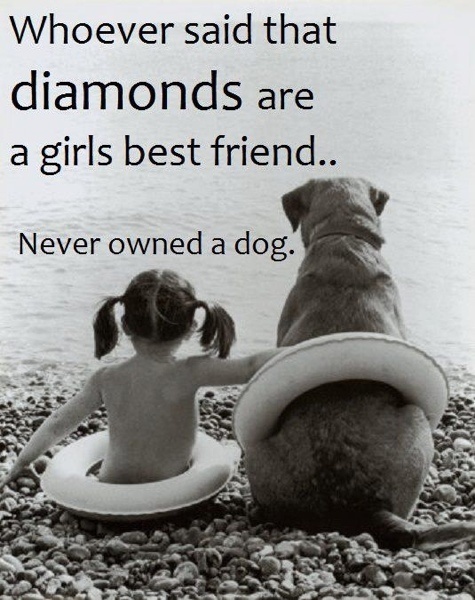 Yes puppys are awesome and I agree with the picture that they are better then diamonds, but hell I am not a diamond person if I had to chose between a diamond or a cute puppy I would take the puppy every times………. Beautiful story Mimi, I understand you all too well. When I was diagnosed with breast cancer 13 years ago my Boston Terrier Lilly was with me every step of the way. When I would wait to cry after my children went to school she would just stay right next to me as if she were holding me. And yes a few years later she was diagnosed with mammary cancer,but she was not as lucky as I. I won’t go further, but there is nothing like my fur babies. Wow Tina…what a wonderful connection you and Lilly had! I don’t understand how they know, how it affects their health – but Bubba’s results were similar to Lily’s and it broke my heart. They are our fur babies – with good reason..
I’m a dog person all the way also, unfortunately we lost our girl last year. But a dog’s loyalty is ultimate and the greeting you get from them when you come home as if you have just made their day, their week, their whole life… priceless. There is a reason why there are therapy dogs and companion dogs rather than cats. I’m so sorry that you no longer have your girl with you…those good byes linger for a long time..I never thought about whether or not there were therapy cats – good point.. I can’t even think about losing our Esti last October without tearing up. She was my first “motherly” love. Dogs are amazing. The only thing better than a dog is an Alice. Just loved this!! My dogs are like more children to me. One is brilliant and huge and wants to be a lap dog and the other is small…not so bright but so darn adorable –he’s my baby! 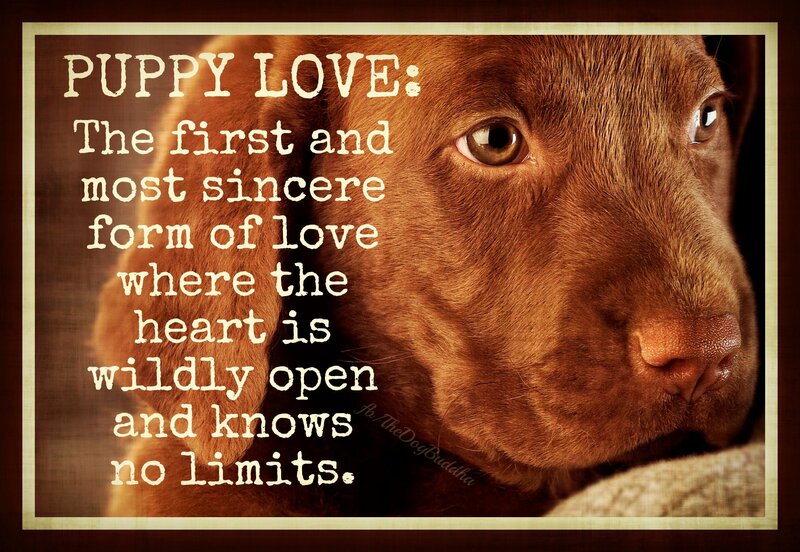 Yes, a dog’s love and adoration is quite an amazing thing! OK, I admit, in this post Mimi had me with the photo of the Chocolate Lab pup, and her post just kept getting better! My dog Duke is a Chocolate Lab who I’ve had since he was a pup. When I’m sick, he never leaves my side sometimes for days on end (except to make a quick trip to answer nature’s call and sometimes eat a little–both of which I also appreciate!). Mimi’s whole first and third paragraphs eloquently describe Duke. It sounds as though she and I are both very blessed in the furry friends department! I loved it so much I reblogged it! Thank you, Mimi! I love dogs as well, but currently have 2 cats. When I was diagnosed with breast cancer, my one cat was like your dog and never left my side…she stayed with me through every surgery, chemo, radiation and still to this day, whenever I have another surgery, she is there with me, quietly on the bed, laying next to me so we are touching, purring away my troubles. There’s nothing like FUR THERAPY ~ whomever your pet may be. I love the visual of your cat humming away right next to you…there really is something so soothing about a cat’s purr. You’re right of course, there is nothing like FUR THERAPY – our pets are amazing. I hope you are feeling better and stronger each day..
🙂 Thank you!! My guys are right here – Teddy in my lap and Archie chewing a bone at my feet. Life is good..
exactly….our little girls are so sweet….usually!